InterExchange Work & Travel USA participants enter the U.S. on a J-1 Visa and are required to apply for a Social Security number. Host Employers must provide information for the most convenient Social Security Administration location in the Arrival Instructions section of their InterExchange account. Use the Social Security Office Locator, to find the closest office to your business. Social Security cards are mailed from the processing center to participants at the address provided on the application form approximately 4 to 6 weeks after applications are submitted. We recommend participants use their host employer's mailing address when filling out application form SS-5. Cards sent to addresses without a mail receptacle may be sent back or severely delayed. Participants are allowed to work and be paid before their Social Security card arrives. After applying, participants will be given a Social Security letter of receipt, which serves as proof that the participant has applied for a Social Security card. Participants should provide you with this letter of receipt and maintain a copy for their own records. Please notify your payroll company that participants may begin work with proof of application. If a participant does not receive his or her Social Security card within 6 weeks, you should have them contact Social Security at 1.800.772.1213 to find out the status of the application. Important: Participants will not be issued a Social Security number if they have not registered in SEVIS. They must register as soon as they arrive in the U.S. through their InterExchange online account. Participants need to wait at least 3-4 business days after registering in SEVIS before applying for a Social Security number. There are sometimes issues or delays with a Social Security application because of security flags or issues with their name being correctly entered exactly as it is on their documents. If your participant needs information on how to apply for their Social Security number or how to fill out application form SS-5, please have them visit our Work & Travel USA Participant Resource page. What are an employer's responsibilities when hiring international visitors who don't have Social Security numbers? Advise participants that they are required to apply for a Social Security number and card. If a participant applied for but has not yet received a Social Security number, ask to see and retain a copy of the receipt letter as proof of application. You should also get the following information as completely as possible: the person's full name, address, date of birth, place of birth, father's full name, mother's full maiden name, gender, and the date he or she applied for a Social Security number. Is it legal for participants on the Summer Work Travel program to start working prior to receiving their Social Security number? Yes. Participants may start working and can be paid prior to receiving their Social Security numbers. We encourage all participants to apply for their Social Security number as soon as possible, but wait at least 3-4 days after registering in SEVIS. They should provide proof of application (a copy of the application receipt and/or a copy of application for SS-5) to their employer. What if my Summer Work Travel employee doesn't have a Social Security number when wage reports (Forms W-2) are due? Paper Filers: If the worker applied for a card but didn't receive the number in time for filing, enter "Applied For" in Box A. Electronic Filers: If the worker applied for a card but didn't receive the number in time for filing, enter all zeros in the field for the SSN. Remember to ask your employees for the number and the exact name printed on their Social Security card when he or she receives it. Learn more on the SSA website. What if I receive the participant's Social Security number after I have filed my wage report? If you receive their Social Security number after you file your wage report, file Form W-2C (Corrected Wage and Tax Statement). Learn more on the SSA website. What if my Exchange Visitor returns home without receiving their Social Security number? Is there a penalty for not reporting a worker's Social Security number? Yes, there is a penalty for not reporting a worker's Social Security number, but this fine is usually waived if the employer can prove reasonable cause for not reporting the Social Security number. Employers will receive Notice 972CG — or a notice of proposed penalty — and will have 45 days to respond. The employer must prove that they acted in a responsible manner and that the failure to submit a Social Security number was not due to willful neglect. Collect employees' proof of application, which can include a copy of their application Form SS-5, a copy of the application receipt (sometimes mailed after they have applied) or a signed statement from the participant stating that they have applied. Document the participant's full name, gender, address, date of birth, father's full name, mother's maiden name, and the date of application. Make at least one solicitation for the correct Social Security number either by mail, telephone, electronically, or in person and document this solicitation and the results. Retaining a copy of Form W-4 can also be considered a solicitation for the correct Social Security number, but additional solicitations may be required. Publication 1586 details the requirements of proving reasonable cause as well as answering additional questions regarding missing Social Security numbers. Section (m) in regulation 301.6724-1 details the procedure for seeking a waiver of the penalty. What if my employee's Social Security card arrives at my business after they have left? If you have a forwarding address for the participant, please forward the card to them. If you do not have an address for the participant, please mail the card to: InterExchange Work & Travel USA, Attn: Social Security Information, 100 Wall Street, Suite 301, New York, NY 10005. We will forward it to the participant. What causes delays when Exchange Visitors apply for Social Security numbers? 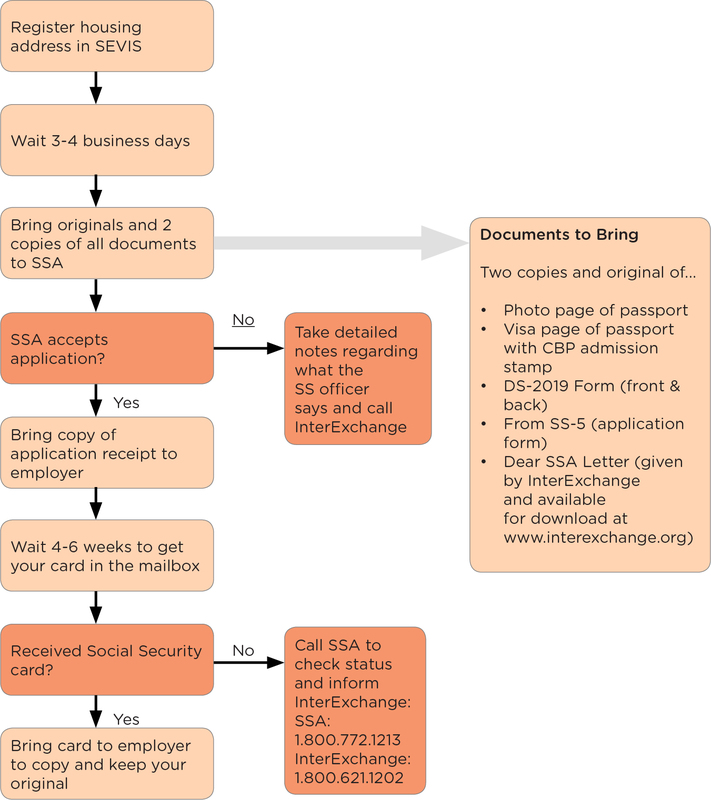 When Exchange Visitors apply for Social Security numbers, the Social Security Administration (SSA) verifies their documents directly with the Department of Homeland Security (DHS). Exchange Visitors must be listed as active in SEVIS before the SSA issues a Social Security number. Most applications are verified immediately, but there can be delays. Social Security understands that this process may affect companies who hire Exchange Visitors, but direct verification from DHS is vital to ensuring the integrity of the Social Security number. Why is a Social Security number needed? Social Security numbers are generally assigned to people who are authorized to work in the United States. They are used to report your wages to the government and when filing your tax return. Also, when opening up a new bank account, banks require either a Social Security number or proof of application for a Social Security number. Your card should arrive in the mail within four to six weeks of your application date. It is important that your mailing address on Form SS-5 is accurate to ensure that your card gets delivered to you. If you change your mailing address after you submit your application to the Social Security office, it is your responsibility to inform the Social Security Administration of this change by calling or visiting any Social Security office. If you do not currently have a valid mailing address, you may have the card sent to InterExchange Work & Travel USA at: 100 Wall Street, Suite 301, New York, NY 10005, and we will forward it to you at a later point in time. If I am a returning J-1 Visa holder and have already been issued a Social Security number, do I need to reapply? What if the Social Security Administration won't accept my documents? The Social Security Administration will not accept a student's application and documents if you have not yet registered your housing address in SEVIS. We recommend going to the Social Security office at least three to four business days after initially registering your housing address in SEVIS. The Social Security Administration recommends waiting at least 10 days after arriving in the United States before applying. If they do not accept your application, take detailed notes of what the Social Security officer says and report this information to InterExchange by calling 1.800.621.1202. What if my Social Security card never arrives? If you put your employer's address on the Social Security application Form SS-5, check with them to ensure that they have not received your card. The Social Security Administration can be contacted at: 1.800.772.1213. An update on the application status will usually be given over the phone. In the event that there is an issue with the application, take detailed notes and call InterExchange to help resolve the issue. You can also reapply in person at your local Social Security office, which can be found at: www.ssa.gov/locator.